An earthquake is a sudden, rapid shaking of the Earth caused by the release of energy stored in rocks. This energy can be built up and stored for many years and then released in seconds or minutes. Many earthquakes are so small that they can not be felt by humans. Some, on the other hand, have caused great destruction and have killed hundreds of thousands of people. The pink lines and dots on the map of the world above indicate the regions of earthquake activity. There are two major regions of earthquake activity. One is the circum-Pacific belt which encircles the Pacific Ocean, and the other is the Alpide belt which slices through Europe and Asia. The circum-Pacific belt includes the West coasts of North America and South America, Japan, and the Phillipines. Over one million earthquakes may occur each year on the Earth. Most earthquakes last only seconds, but some large quakes may last minutes. 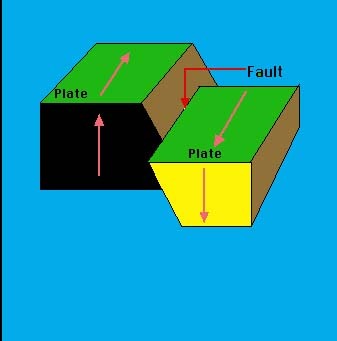 About 90% of all Earthquakes are produced at plate boundaries where two plates are colliding, spreading apart, or sliding past each other. When these plates move suddenly they release an incredible amount of energy that is changed into wave movement. Earthquake waves resemble sound and water waves in the manor in which they move. It is these waves that roll through the Earth's crust causing buildings to collapse, bridges to snap, mountains to rise, the ground to fall, and in some cases the ground to open up into huge cracks. Why do earthquakes occur? Scientists believed that the movement of the Earth's plates bends and squeezes the rocks at the edges of the plates. Sometimes this bending and squeezing puts great pressure on the rocks. Rocks are somewhat elastic, they can be bent without breaking. Have you ever stretched a rubberband? You know if you increase the tension too much though, the rubberband will snap!! Rock layers act somewhat the same way, if the pressures becomes too great the rock layer will break and move. When this occurs the layers will move along a crack in the Earth's crust called a fault or the release of energy will cause a new faultline to be produced. This rupture of the rocks and the resulting movement causes an earthquake. This is an aerial photo of the San Andreas fault line in California. 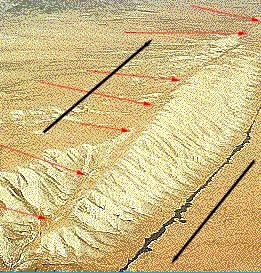 The red arrows point to the crack in the crust that is the surface fault. This fault is the boundary between two huge plates, the North American plate and the Pacific plate. The two plates are sliding past each other in opposite directions. This type of plate boundary is called a transverse boundary. A transverse boundary is actually a tear in the Earth's crust. The black arrows represent the directions that the two plates are traveling. This fault line is perhaps the most studied transverse boundary in the world. Many earthquakes each year occur on the San Andreas fault which runs in California from the Mexico border east of San Diego north to the San Francisco Bay area. The next photo shows the destruction that occurred during the 1971 San Fernando earthquake. This aerial photograph shows the destruction that occurred during the February 2, 1971 San Fernando earthquake. 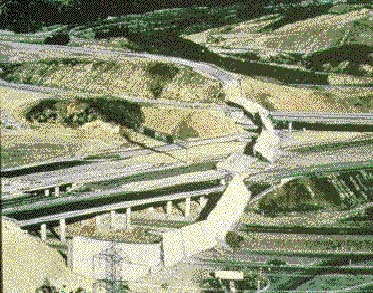 The freeway bridge and road were extensively damaged during this shaking of the crust. 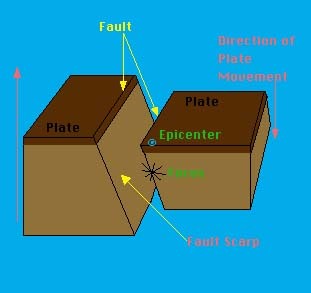 When an earthquake occurs an area of the crust will move very suddenly and with a great release of energy. The point of the actual rock rupture is called the focus . The focus is usually found far beneath the surface. The point directly above the focus on the surface of the Earth is called the epicenter. When the rocks move suddenly they will produce waves in the Earth's crust. These waves move out in all directions and can produce widespread damage on the Earth's surface. When the rupture of the rock occurs the release of energy causes seismic waves to be produced. Just as wind energy causes waves in water to move across a lake or ocean, seismic waves move through the layers of the Earth. These seismic waves are what produces the destruction that can accompany an earthquake by heaving, shaking, and cracking the ground as they pass through an area. The seismic waves spread out in all directions from the focus. 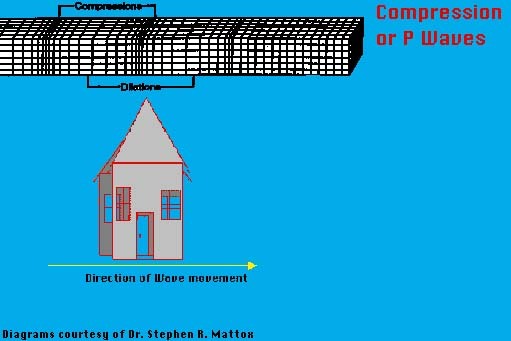 Compression waves are one type of seismic wave. They are the first to arrive at the surface of the Earth. Because of this they are given another name, P or Primary waves. P waves are the fastest of the seismic waves. They travel at incredible speeds, 14,000 m.p.h at the surface to over 25,000 m.p.h. through the core of the Earth. P waves are even able to pass all the way through the entire Earth. When P waves strike an object they push and pull the object , like a train engine bumping into a railroad car which then bumps into another and so on all the way through the whole length of the train. This jackhammer movement is the first sign that an earthquake is occurring. As a wave passes through a house, the house is pushed and pulled. If the house is not strong enough it might collapse. Shear waves reach the surface shortly after the P waves and are given the name S or Secondary waves. S waves travel at about half the speed of P waves. They move objects in their paths in an up and down motion in the direction that the wave is moving. S waves can only move through solids and because of this can travel only through the crust and mantle of the Earth. When S waves strike the outer core, which is made of liquid iron and nickel, the waves stop. 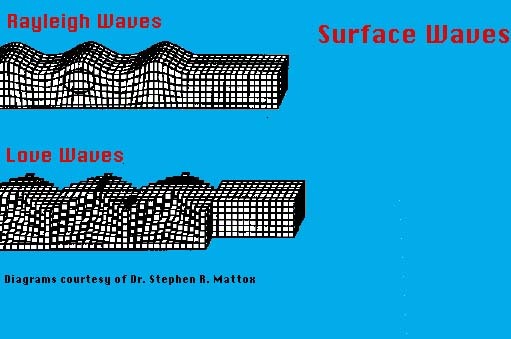 Surface waves are the third type of wave. These are the waves that produce the most destruction. They originate from the arrival of P and S waves at the surface. They are much slower than both P and S waves. Surface waves are limited to travel along only the surface of the Earth, just as waves in a body of water are limited to travel along only the surface of the water. There are two types of surface waves: Love waves and Rayleigh waves. Love waves move in a manner very similar to S waves but the movement to objects in it's path is side to side instead of up and down. Rayleigh waves travel much in the same way as waves in water. Rayleigh waves have an almost circular pattern to its wave motion. The Richter Magnitude is a number that is used to measure the size of an earthquake. The magnitude is a measure of the strength of the seismic waves that have been sent out from the focus. A scientist uses a seismograph to determine the strength of the earthquake. 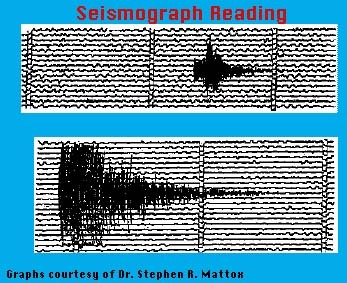 A seismograph is an instrument that measures the amount of ground motion that an earthquake produces. Each number on the Richter Scale represents an earthquake that is ten times as powerful as the number below it. Examples: An earthquake measuring 6 is ten times stronger than a magnitude 5 quake. 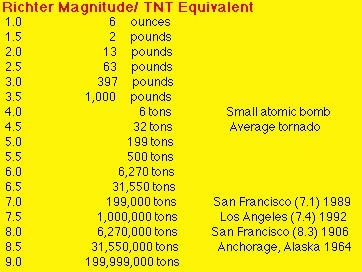 An earthquake of a magnitude 9 is 10,000 times more powerful than a 5. The strongest earthquake ever measured was a 8.9 off of the coast of Ecuador in 1906. Earthquakes of 6 and above are considered major quakes. Earthquakes of 7 and above have the ability to do great damage and kill many people. Each of the graphs on this page shows an earthquake reading on a seismograph. The waves from an earthquake sets a writing device in motion showing the magnitude and the length of time that the earth is in motion during a quake. The strength or magnitude is recorded in the verical (up and down) lines. The stronger the quake the longer the lines will be drawn on the graph. The duration (length of time) that a quake occurs is represented in the horizontal lines. The duration of the earthquake in the top graph shows a quake lasting about 40 seconds. Each box on the graph is a one minute time duration. The bottom earthquake lasted about one minute and 20 seconds. Write your answers to the questions below in complete sentences on a piece of paper. Use the page titles directly under the questions to move through the lesson to find the answers for the questions. When you are finished click on the Earth icon so that the next group can begin the lesson. 3. 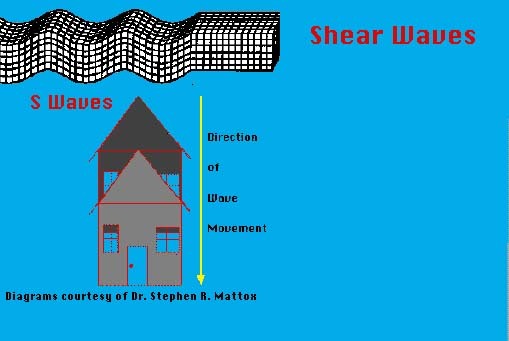 What are the differences between compression, shear, and surface waves?